We must ask ourselves whether worship was meant by God to be entertaining. Shouldn’t worship be something different than what the world produces? Shouldn’t worship be something that reverences God rather than regales the congregation? Compared to the contemporary worship of most Protestant churches and post-Vatican II Roman Catholic churches, the worship of the Orthodox Church seems overly-formal, complicated, and rigid in its rubrics. Why are there so many rituals in the Orthodox Church? Why isn’t there more spontaneity, creativity, and freedom of expression? Why is the Orthodox Sunday worship service—the Divine Liturgy—essentially the same week after week, every year, for more than fifteen-hundred years? Most Orthodox believers would respond, “Because it is our Tradition.” However, do you know why it is our Tradition and why rituals are so important to our Christian Faith? An “ordinance” is a decree that an activity be regulated (Hebrews 9:1)—kept to a particular sequence or boundary. In regards to worship services, the Apostle Paul stated, “all things should be done decently and in order” (1 Corinthians 14:40). The reason for this is given in a previous verse: “for God is a God not of disorder but of peace” (v.33). In fact, St. Paul praises the church at Colosse for how orderly (τάξιν) they are (Colossians 2:5). Being that our present day Liturgy of St. Chystostom is based on the first century Liturgy of St. James, the first Bishop of Jerusalem, the Orthodox Church has always practiced a formal, orderly pattern to its worship. However, the formality of worship really goes back to Judaic practices starting 13 centuries before Christ with the exodus of Israel from Egypt. God, through Moses, gave explicit details about a very orderly and elaborate form of worship centered around the Tabernacle or Temple. Why? Because God knows how easy it is for mankind to argue about worship practice differences to the point of confusion (Acts 19:32), prejudice (John 4:20), and violence (Genesis 4:3-8). It is not hard to look through the history of mankind and find wars which were in part justified over disputed religious beliefs and practices. Though inter-faith conflict will likely continue (John 17:14), God wants to prevent intra-faith conflict within His Church (John 17:22-23). Therefore, it is necessary the Church be unified in Her worship practices. The Orthodox Church has kept the unity of the Faith in part by preserving a precise formula in Her worship. In doing so, the Orthodox Church has avoided a lot of dissension that has plagued other branches of Christianity. “Observance” denotes the need to pay attention and to remember. Six times during the Divine Liturgy the priest or deacon is giving the exhortation “Let us be attentive.” God doesn’t want us to just show up at church and habitually say and do the rites while our minds are occupied with work, grocery lists, or a recent argument with our spouse. Such worship is not “in spirit and in truth” (John 4:23-24). God desires we focus on what every word said and every gesture made alludes to within the Divine Liturgy (and other worship services). This takes discipline on our part, but it is through discipline we become righteous sons and daughters of our Father (Hebrews 12:4-11). Observing the Divine Liturgy disciplines us to “fix our eyes on Jesus, the author and perfecter of our faith” (Hebrews 12:2). It is only by being attentive we will gain understanding (Proverbs 4:1, 20; 5:1; 7:24; 22:17), find God’s direction for us (Exodus 23:20-21), and enjoy His blessing (Deuteronomy 7:12-13; 28:13). Attending to the teachings of the Church both through Scripture (2 Peter 1:19) and Tradition (Hebrews 2:1) keeps us from drifting into heresy. A good Biblical definition of observance, that we should remind ourselves of as we enter a church, is: “Mortal, look closely and listen attentively, and set your mind upon all that I [God] shall show you, for you were brought here in order that I might show it to you” (Ezekiel 40:4; see also Isaiah 28:23; 34:1). The Bible is filled with exhortations to not only attend but to also remember. We need to continually be reminded of: who God is, how God has saved us, the miracles which attest to God’s love for us, the commands God taught us, the saints of old who inspire us, and also remember those that need charitable aide or divine intervention. The high point of the Divine Liturgy is when we observe the sacrament of communion, which was commanded by God to be done “in remembrance” of Christ (Luke 22:19; 1 Corinthians 11:24-25). Orthodox worship services, particularly in its litanies and hymns, are specifically designed to help us remember. Some may argue it is easier to lose one’s attention within Orthodox services because they are so repetitive. It is believed contemporary services draw one’s attention better because they change from week to week and are therefore more stimulating. 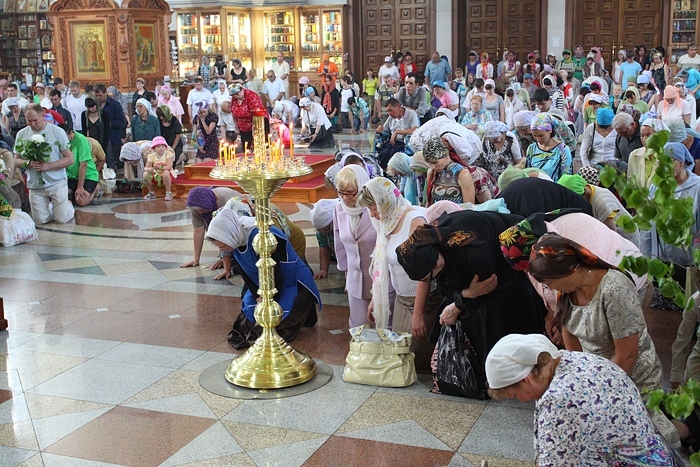 First, it should be noted that Orthodox services are not completely repetitive—the readings, the homilies, and a few of the hymns do change every week. Second, repetition is good for us: it is how we learn. Besides being an assembly by which we give God His due—praise and thanksgiving—Orthodox worship services are also classrooms of instruction about how to rightly believe and behave. Part of the reason why the worship of the Orthodox Church is so ritualistic is because a lot of information is being condensed within a ninety minute service. 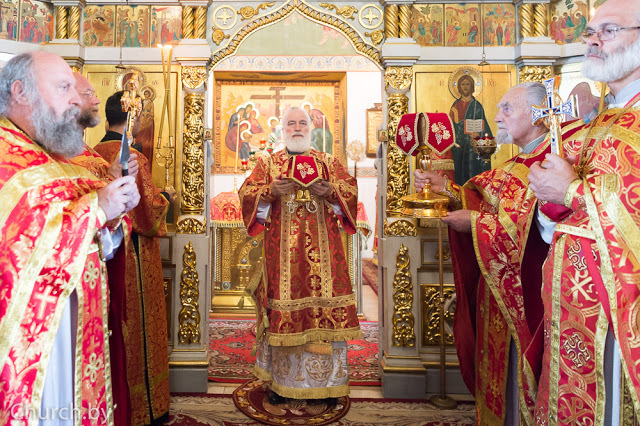 You can spend decades going to Divine Liturgies every Sunday and still not plumb all the rich, symbolic depths of meaning found in that ceremony. The Divine Liturgy is unchanging because its formula works to help us grow in knowledge and virtue to become Christ-like—which is the purpose of our lives (Colossians 1:28-29; 2 Peter 3:18). Even if our attentions occasionally wander (which they shouldn’t! ), something of the service is still absorbed within our spirit to bless our souls. Repetition is transformational. 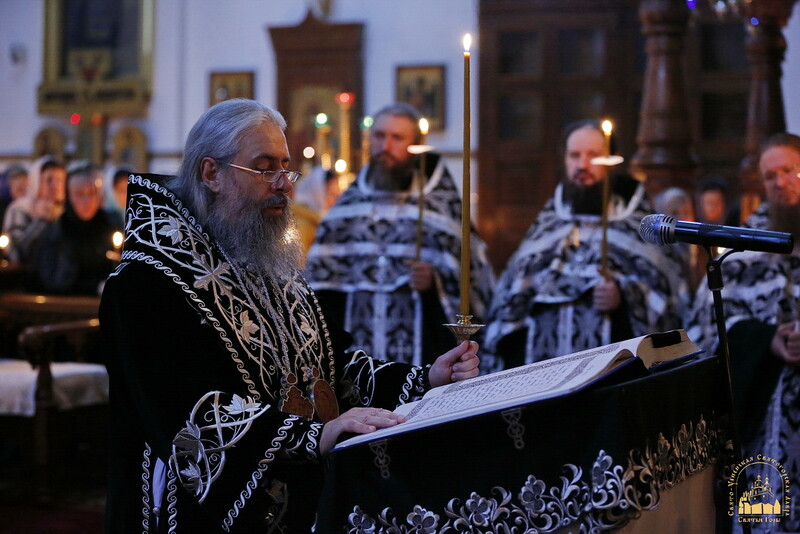 After a while, the Divine Liturgy becomes more than an ordinance or an observance; it becomes something intimately a part of out lives—like the beating of our hearts (and no one complains when are hearts keep the same life-giving rhythm!). The contemporary worship services of non-Orthodox churches can be very entertaining. The electronically amplified instruments, the emotional praise choruses, the dramatic preaching, the multimedia presentations, can all make for an enjoyable service. However, watching TV, going to a movie, or being at a music concert can also be pleasurable. Yet how much do we actually remember from these events? How much of it helps us to grow towards maturity in the Faith (Hebrew 5:12-6:1)? We must ask ourselves whether worship was meant by God to be entertaining. Shouldn’t worship be something different than what the world produces? Shouldn’t worship be something that reverences God rather than regales the congregation? “Liturgy” means “work of the people.” God desires that we love Him with all our heart, all our soul, and all our might (Deuteronomy 6:5, emphasis added). Participating in the Divine Liturgy is not a physically comfortable experience: there is standing, kneeling, and prostrations. One doesn’t (or shouldn’t!) just passively watch a performance at an Orthodox church service. The laity is invited to be involved throughout the service in reverencing icons, joining in the singing of the hymns, reciting the Nicene Creed, and adding their hearts or voices to the prayers. It you are not a little tired when the Divine Liturgy is finished then you haven’t fully been worshiping God. Though worship can be a joyful celebration (Psalm 100:1-2), Scripture makes it clear that God desires worship to also be costly. The first recorded act of worship was the story of Cain and Abel, the sons of Adam and Eve, when God accepts Abel’s sacrifice but rejects Cain’s (Genesis 4:3-7). God explained that not just any offering will do, but only the best of what we have to give will receive His approval. The animals sacrificed to God had to be without defect and therefore they were the most valuable of the herd (Leviticus 1:3). The Divine Liturgy was refined over the early centuries to make it the best worship service we can offer to God. It has stayed the same since then because no Orthodox theologian has figured out how to make it any better than St. Chrystostom’s fourth century version. In summary, Orthodox worship services are ritualistic because: (1) God desires that our services be orderly as a reflection of Himself. (2) Our Lord desires a set pattern of worship to maintain unity and avoid dissension. (3) The services require we discipline ourselves to attend, remember, and participate; so that we might be perfected in the Faith. (4) Worship was meant to be costly—requiring the best that we have to honor God with. “Therefore, since we are receiving a kingdom that cannot be shaken, let us give thanks, by which we offer to God an acceptable worship with reverence and awe; for indeed our God is a consuming fire” (Hebrews 12:28-29).